Let’s look closer at what happened in that Gospel we just heard. Two friends of Jesus are on a journey. They are talking about Jesus being killed on Good Friday. Then Jesus – without them recognizing him – comes alongside. at that very instant, he causes them to recognize him. And in that same moment, he disappears. but more than that, it means the Holy Mass. When we come to Mass, what do we do? and the priest or the deacon helps us understand it better. recognize Jesus in the breaking of the bread. Now notice, Jesus didn’t start with sharing the Eucharist. Sometimes that is what people would like. she wanted me to distribute communion, without the actual Mass! What she called, “the stuff in the middle”? That’s the heart of the Mass! to make his dying and rising present. That “stuff” is the all-important “stuff”! and that’s why he changes the bread and wine into his Body and Blood, for us to share. is the dying of Jesus and his rising from the dead. At Mass, the priest is at the altar acting for us, in our name. 1. I am a sinner and but for this sacrifice, I would be going to hell. 2. I believe Jesus is my Savior, my Lord and my God. I’ve gone to confession and been absolved. every hour of every day of my life. That’s a lot to say yes to all at once! when we take the Body and Blood of Jesus to our lips. from what Jesus himself said “yes” to on the night before he died. The “cup” is the Cross. He accepted it. we are accepting the Cross as well. like those disciples on the road, need help to understand it. it takes time to consider, and learn, and pray. That’s why Jesus took time to open the Scriptures for those disciples. So let’s make an obvious application. then we had better be prepared to invest some time and effort. And this explains the logic of Mass every single Sunday. Not once a month, not a few times a year, but every single Sunday. we don’t really understand what’s happening. Now let me put some of this on myself. It is the job of the priest to open up the Scriptures for you. notice Jesus spent a couple of hours with these two. and this year, we ran a deficit. so I don’t have to cut back on what we offer. and the talks and events we schedule. we have materials available online – for free! – at Formed.org. You can access them, at home, at any hour, day or night. Even so, you can help me do a better job for you. And I mean more than giving in the collection – although that will help! or else, look for another way to do it. I’ve done what I can today to explain these Scriptures. Only Jesus can open our hearts – and that, only if we let him. At this and every Mass, Jesus offers us his own Body and Blood. Saying “yes” – saying “amen” to his Gift – changes everything. This will happen here in a few minutes. Why is Trump continuing Obama's war on the Little Sisters? On these pages last year, I was attacked viciously by those claiming to be true Catholics (unlike the apostate they deemed me to be) for one simple reason: I did not think candidate Donald Trump worthy of my own support. I demurred, among other reasons, because I wasn't convinced of his sincerity of conservative convictions. -- Earlier this year a proposed executive order safeguarding religious liberty was being circulated, but then faded from view. Supposedly, it's still being worked on. -- The Trump Administration is continuing with the Obama-era lawsuit against the Little Sisters of the Poor, which arose because of the former president's mandate that employers facilitate their employees obtaining contraception and abortifacient drugs. From the linked article: "As things stand now, it appears that Justice plans to continue defending the way the Obama administration applied the birth-control mandate, said Eric Rassbach, a Becket attorney. 'That just seems to be very contrary to what they’ve been saying publicly,' Rassbach said." This isn't the Trump Administration we were promised, it seems. so you would expect me to talk about that. which means it’s about the Resurrection. it is only real, if the Resurrection is real. flows from the Crucifixion, from his death on the Cross? then why would you believe his death would in any way save you? and, he said that he would rise from the grave on the third day. So again, if that didn’t happen, why believe anything he promised? and will do what he said you will do. you are still in your sins” (1 Cor. 15:17). isn’t simply a collection of ideas. although they may not realize that is what they are doing. do we, as Catholics, have to accept the theory of evolution? about the marvelous “how” of God’s creative work. to discover how even more wonderful God’s ways are. So back to the Resurrection. not only of ideas, but of facts. and on the third day, he rose again. and left the grave where it had been laid. and you should all find something else to do on Sundays. to say about the Resurrection of Jesus Christ. One is this: why would the early Christians even make the claim? That is, if it didn’t happen, why invent it? And if you say, well, but Jesus predicted it – and that’s true. But if that failed to happen, then you have three options. First, stop following Jesus, because he proved not to be the Messiah. than fudging over the problem of him not rising from the dead? they pretended Jesus had been raised from the dead! as we see in today’s Gospel. Now, Thomas’ reaction makes perfect sense. had later risen from the dead? He said what we would say. And Mark’s Gospel tells us that the other Apostles also doubted. This doubt is entirely reasonable. business owners – people not so different from us. rather than deny what they saw and heard. what Jesus shows us in his risen, glorified body isn’t mainly about him; it’s about us. He shows what you and I can look forward to with confidence. he promised to call us back to life as well. You and I will experience the very same – the exact same – resurrection as Jesus. and our souls and bodies will be reunited. We will live forever. And this will either be in the happiness of heaven, or the pains of hell. to the limitations and frailties that we know in this present life. no more crutches and pain pills and all the rest! God wants us to experience and trust in, this is the WHY of it. God wants you and me to live in hope. He wants us to know what great hope lies ahead. Jesus came to give us life, and that more abundantly. so that we would return to him and know that abundant life. but also, to SHOW us what that abundant life was like. are marking this night, this day, the day that the Lord has made. and opening the path for us to heaven. 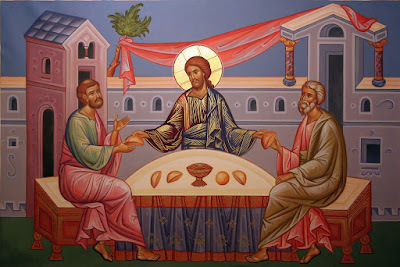 That is why Alleluia belongs to this day: praise the Lord! This is the day of victory! But what victory, exactly? What is this triumph? Are we claiming that we will not die? We know that we will. not a grave, but heaven! And what do we mean by this defeat of sin? I still struggle with sin. I’m guessing you do, too. But we have seen God weigh into the battle – for us and with us. so did our sins and all our condemnation! all that power of Jesus’ blood is poured out for you. No one else can take away sin but Jesus. “Behold the Lamb of God who takes away the sins of the world. Not everyone celebrates this victory tonight. or they do not care. They do not believe. Many in our own country have only a passing awareness. has become a steady, background buzz in their ears. or tuned out. Maybe someone hurt them. And the saving work of Christ is a little distant. Some just sort of drifted, and haven’t found their way back. what we will give our life for. Do not think you can stand off to one side, and stay out of it. Not choosing is to choose. Lots of people live for enjoyment, for fulfillment, for pleasure. This sounds worse than it is. a desire for the new and exciting, is built into us. they aren’t enough to be the focus of life. I can live for me, or I can live for others. that’s all they have in the end: themselves, and nothing else. Many people give themselves to their careers, to sports, to causes. Again, nothing wrong with this; indeed, there’s a lot to admire. Still, it’s not enough. All these things can and will fail us. Men and women around the world give themselves for their families. Is this not a worthy thing? Certainly it is. Or for their country? Do we not admire this? With all our hearts, we do! But again, for what purpose? In loving our country, or loving our family, what do we want for them? without having any sort of idea of what my country will BE? If I sustain and protect my family, is it for any purpose? What do I teach my sons and daughters? Does this matter? is this not what I want for my children as well? Mohammed did not die for me. He may have some things to teach me, but he did not rise from the dead. Shall I seek out Buddha? Buddha, too, is not God. Buddha teaches that peace is found on the path of negation. no need, nothing at all. But Jesus says, this Creation is very good, even if it is broken. He came, not to escape this Creation, but to redeem it. Brothers and sisters, we have completed our time of penance. and, even more than that, our own radical dependence. You and I cannot live a day, not an hour, without God’s help and grace. so we know what lies ahead! The outcome is certain; the battle is won! We have been forgiven, and we can dare to be generous in forgiving! This is our victory, this is what Jesus has won for us. This is why we sing victory tonight; this is why we celebrate. Jesus has risen! Jesus has conquered! We are free! what will you live for? What will you fight for? What will you give your life for? those who claimed Christ paid with their lives. in Africa, and many other places around the world. it may cost you a promotion. It may bring you derision and embarrassment. their jobs and their businesses; so it may be for us. The question is before you. We can postpone it, but never escape it. We will live our lives for something – what will we choose? Justin wrote this in the year 155. That was something that has been emphasized since the 70s. There was a feeling that this wasn’t emphasized enough, before. Doesn’t that help emphasize that something else is going on? which the first reading describes. something the Prophet Jeremiah foretold. Notice, I said that the New Passover takes place over three days. Three nights, to be precise. Tonight we remember the beginning. Tomorrow is when the Passover Lamb was slain. And then, late at night on Saturday, we celebrate the Resurrection. is on the Lord washing the feet of the Apostles. What people remember is the act of profound humility. Well, these men are Jesus’ priests; and so, Jesus washes them. I'm organizing a pilgrimage! Would you like to go? This trip is my own idea; I've been working on it for a couple of years. To my surprise, I couldn't find anyone who was already doing it, and the first outfit I approached decided it wasn't worth pursuing. So what's the plan? We're going to visit and pray at the shrines of the North American Martyrs and Saint Kateri Tekakwetha in upstate New York; then visit the National Shrine of Divine Mercy in Stockbridge, Massachusetts. If time allows, on the way to New York City, we'll stop in New Haven to pray at the shrine for Venerable Michael McGivney, founder of the Knights of Columbus. In New York, we will visit shrines for Saint Elizabeth Ann Seton and Mother Francis Cabrini, and pray at the tomb of Pierre Toussaint in New York's majestic, and newly renovated, Saint Patrick's Cathedral. While in New York, we'll have a panoramic tour of the city, with a stop at the 9/11 Memorial. Plus there will be time for your own sightseeing, or to take in a show. This is a true pilgrimage: we will have Mass every day at the shrines of the saints, and time for personal prayer. I will have some information to share about the lives of these and other American saints who helped shape our nation and our Catholic Church on these shores. If interested, click the image above to visit the webpage for more information. Edit: I posted this too fast! I meant to explain that when I first began organizing this, I developed quite a longer list of American saints and blesseds; but visiting their shrines would take us to points west (Missouri, California and Hawaii, for example). Even when I tried to keep it to the northeast, my list of saints was more than was practical for this trip. For a young country, we can take virtuous pride in the number of saints and blesseds associated with our nation! is that there is a series of processions. in procession – just as Jesus entered Jerusalem long ago. from the Upper Room, to the Garden of Gesthemane. are led by that same light to be baptized. It means that you and I are invited to walk this week with Jesus. to Bethlehem, to Jerusalem, to the Cross, to the tomb, and to life. but we’re walking with Jesus; we’re walking to life! 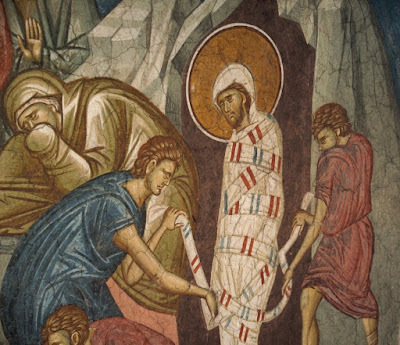 the body was wrapped in strips of cloth. had called him from death back to life. and they had to be taken away. Jesus speaks directly to us. He revives us. there are still things binding us, holding us back. is at work in the sacrament of reconciliation? Is this just a ritual, or do I believe real power is working here? in the Blood of the Lamb”! while expecting little to change. Don’t sell short the wonder-working power of His Blood! it may be something we need fully to dethrone and renounce. and move it somewhere else; it has to be cast away, forever. To give a concrete example: for some of us, alcohol is too important. have resentment – but none of this really changes the truth. For some of us, the only answer is to renounce it and remove it. about lots of sinful habits and attachments we cling to. The third chain – and often hardest to let go of – is unforgiveness. Look: forgiving someone isn’t saying what he or she did wasn’t wrong. It doesn’t mean what happened was OK.
you are giving that person to God. Let God take care of it. that there is no perfect justice in this world. give them to God. Let go and let God. will benefit from that letting go of a chain that binds you. I’ll just point you to his advice, on page 152.
that is, the Sacrament of Confession. 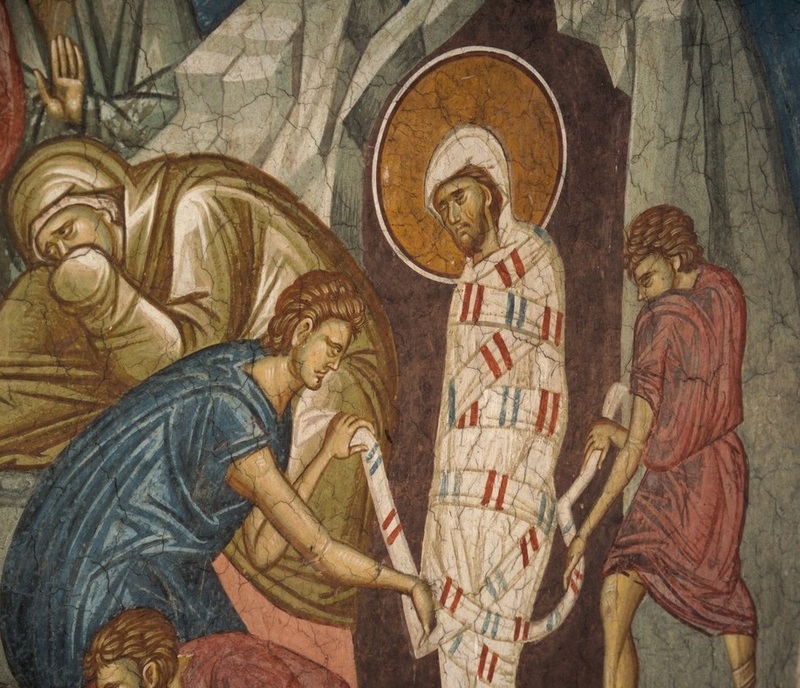 to his suffering, his death and his resurrection. To enter into these mysteries. How can God love me? Does he really forgive me? Can I really change? Do you want Jesus to call you to life? Come to confession! on Tuesday, Wednesday, Thursday, Good Friday and Holy Saturday. Jesus wants to untie you and let you go free.